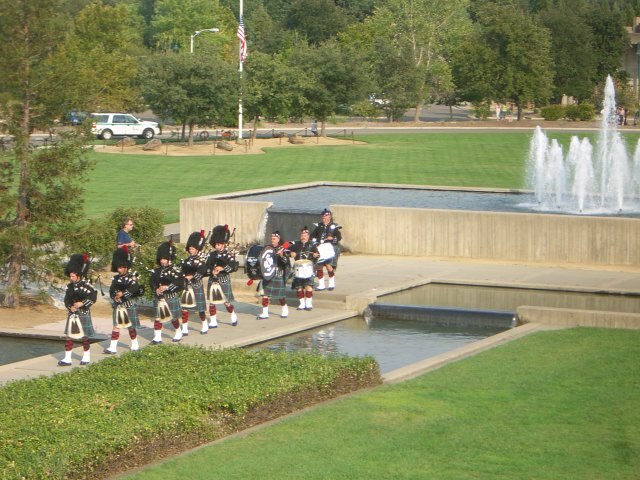 A Fallen Firefighter celebration/memorial service, replete with 8-man bagpipe accompaniment, Last Alarm Ceremony with Ringing of the Bell, and Taps, is a profound experience. 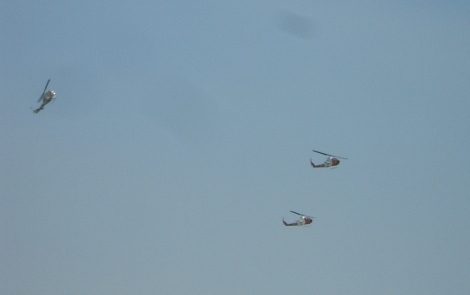 Jim's was capped off by a flyover formation of four Cal Fire choppers. Not a dry eye in the house. Well over 3000 firefighters, pilots, friends and family attended. The Redding Convention Center parking lot was jammed, including over two dozen fire engines and uncounted Cal Fire/USFS official vehicles. The love and respect that Jim had earned from peers was extraordinary. It was reported by a survivor of the accident that Jim's last act, with no other announcements or warning from the flight crew, was to instruct occupants to assume the crash position; that survivor (his 2nd flight in a chopper) credited Jim with saving his life. Jim and Diane's involvement in AAM/SGN was duly noted several times. A picture of Tony and Sharon Coalson with the Ramages was part of the slide-show, and Tony's letter about Jim was an inspiring capstone to comments from those attending. I presented Diane and Ginger with AAM caps on behalf of our membership; they asked me to pass along their appreciation. The nature of the AAM/CASI experience probably precluded such events, which is a shame; survivors at AAM/CASI deserved, but often did not receive, the same level of support. Regardless, Diane and Ginger were rocks throughout the event, although many others were overwhelmed with emotion. Jim earned his retirement and is at peace. We're still in the fray----keep the faith. It is with great sadness that I pay tribute to my fellow aviator and dear friend Jim Ramage. Every story has a beginning and an ending. Ours began on Oct. '70 when I arrived in Saigon with Air America® and began a close professional relationship and a lasting friendship with Jim and Diane Ramage. During our visits the conversations would always turn to aviation as we would share our Air America® stories -as all pilots do- and our personal flights together -- they were the same stories but we enjoyed telling them over and over and each time they were just as exciting as the first. Over the 38 years of having the privilege of Jim and Diane's friendship, there was no fellow aviator who maintained the highest professional and personal standards as Jim. Jim would set the standard for all of us to follow. I truly admired his flying skills and looked forward to the times we would be assigned the same flight. I had tremendous confidence in Jim's skill and ability as we would complete our assigned missions. We studied together in ground school, check rides, discussed missions and planned flights together. 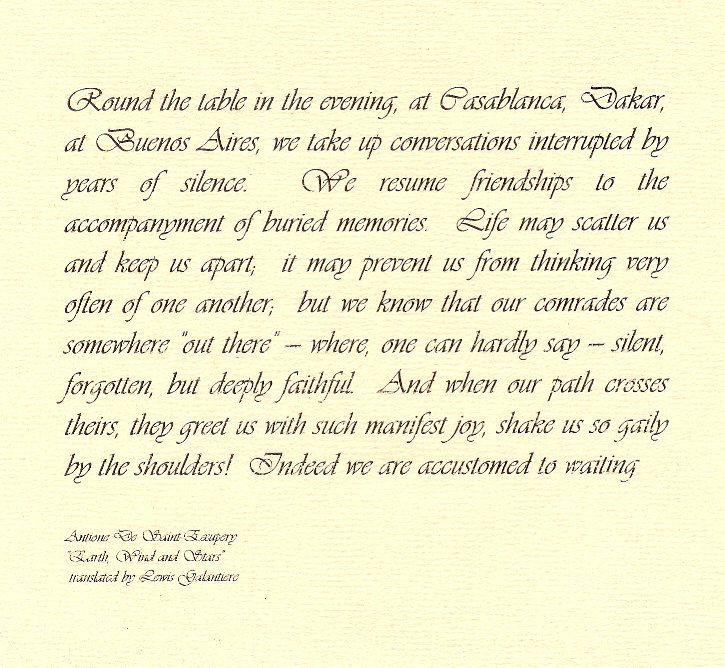 Our most enjoyable times were sharing our friendships and our travels. Jim had a wonderful sense of humor which was warm and genuine and was never without his ever present smile. Jim devoted his life to what he loved -- his family and aviation, they both were equal in Jim's eyes. During the 38 years Jim never made a belittling or derogatory remark concerning our peers - he was always positive with a wonderful outlook on life and a love for aviation. I envied Jim because he was still in aviation where as with so many of us, age slips up on us and we fall by the wayside -- timed out as we say - but Jim was still in the game - right to the end. Aviation by nature is an unpredictable profession and for those of us who undertake the challenge, we do it for the love of aviation and the rewards of personal satisfaction of knowing that we can do it. The photographs of Jim and Diane from '70 in our Air America® days up until our last Air America® reunion in June '08 are throughout our numerous photo albums of memories and with great sadness we share Jim's passing but he leaves behind treasured memories. As with most of us who flew with Air America® -- our Air America® days were our best and our most memorable. After Air America®, Jim continued his aviation career with the California Division of Forestry and Fire Protection based at Vina Helitack Base, Vina, Ca. and was promoted to CDF Chief Pilot retiring from CDF in 2003. Not content with retirement Jim returned to aviation as the Helicopter Inspector Pilot for Fire and Aviation Management, US Dept. of Agriculture. Jim had the distinction of holding badge Number One with CDF. As Jim assumed greater responsibilities along the way, the position and the increased responsibilities never affected his humility and good humored disposition toward all who knew him. As those of us in aviation are aware -- there are two categories - pilots and aviators... Jim was truly an aviator of the highest order. Sharon will so happy to welcome her old friend with a smile and an outstretched hand along with our dear departed friends - Herm Gehring, Jim Linebarger and so many of us who have gone on. 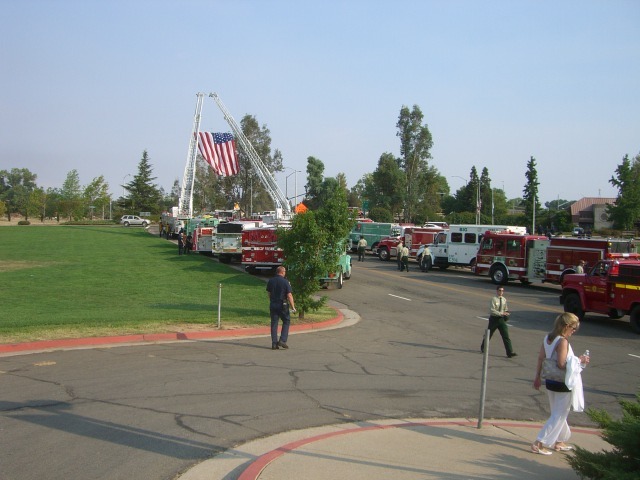 May his spirit forever soar in the heavens..
Friday, August 8, 2008 S-61 Helicopter Crash On The Buckhorn Fire! It has been a long while since I last posted on the blog... I got busy with the season as always, and then before I knew it we were being released off district and on our way to Northern California to join in the massive efforts to support the wildfires ravaging their vast country. We had a difficult begining to our roll, and it only seemed to worsen with time. Early on in our assignment to the Iron Complex near Weaverville CA. the life of a National Park Service employee was lost during felling operations. We were at the incident during this tragedy and it was difficult for some of my crew to undergo the helpless feeling of listening to the tragedy unravel over the radio, only later to find out that the firefighter had lost his battle with life during transport to Redding. Following this incident we moved our operation over to the Willow Creek Helibase and continued to support the several fires on the Iron Complex. We had supported with troop shuttles, recons, and even the cutting of several helispots and digging line in preparation to hold the Buckhorn fire. Our days were filled with transporting people, and slinging gear into place for many operations that seemed to be a small, inconsequential effort against a fire that was determined to take more acres. Tuesday August 5th approximately 1900 hours! Our helicopter was given the mission to assist with troop transport by pulling the helitack off of H-44 following the massive troop shuttle utilizing the S-61's. We had been utilizing the 61's very frequently over the many days previous to this, they are large and efficient in pulling large numbers of people off of the hill. There seemed to be some mission urgency this day, as incident personnel were worried about potential lightning forecasted for the days to come. The idea was that we needed to get the crews off of these high ridges where they had be working for several days to construct line and prepare to burn out the ridges. During a meeting that morning at helibase several of us managers got together and it was asked by all of us... why the rush to pull so many crews off the hill in order to avoid lightning? Our question was, has anybody done a risk assessment to determine exchanging one risk for another. In the end the decision was that we are to execute the decision made by those on the fire whom make such decisions. And in the end this was a logical thing to do... we are a culture of people at the helibase that have a "can do" attitude, and truth be told... hauling people to and from the hill is part of what Helitack and Helibases do. As such I found myself discussing with my pilot whether I would accompany her to the hill in order to extract the two helitack off of the Price Valley crew that had been delivered earlier in the day to H-44. I wasn't necessarily needed, but decided due to our pending departure planned for the following day, that I would enjoy a final flight over the fire that I had devoted the previous 18 + days to. Shortly after 1930 we launched from Willow Creek Helibase in our helicopter (420RL)... a bell 206 L4 operated by Hillsboro Aviation. Just myself and the Pilot (Nicole Ludwig) on board. I was jovial as we left the base, laughing with my pilot about the inefficiency of the government and some of the decisions made on the fire... Nearly immediately after launch we were contacted and the Helibase asked if we would be willing to help with the transport of crews from H-44 to H-21 (junction city). Although this was not our intent when we lifted we confirmed that we would do what we could in order to support this effort... A short conversation was had between myself and my pilot about confusion concerning the fact that we were supposed to be launched when the troop transport was complete in order to retrieve helitack... not launched during the transport in order to assist, and had anyone told us before we launched that this would now be the mission I would have sent others or at least had additional crew with me (later I would be thankful for the lack of knowledge). Our minds had not quite settled on our new orders when the radio call was made... "Aviation Incident With Fire on H-44"
I don't know exactly what went through my mind, however I did begin to focus intently on the radio traffic which was slow to begin... but was ramping up quickly. I could see a small dark column of smoke rising from the ridgeline in the direction of H-44. "could that be the accident?" I snapped a picture with my camera... and looking down at our GPS realized that it could very well be that I was seeing the smoke of the crash, although it was eerily like that of a single tree torching however, somewhat darker in color. I made a call over the radio to inform helibase that we were only a couple of minutes out of the incident, and I inquired about the HLCO (helicopter coordinator) which was responding from another area of the fire... he was not yet on scene! It looked as though we would be the first to arrive on scene and I began to prepare myself mentally for what I was about to see and how I would be of assistance. I have often utilized a phrase with my crew as we approach an Initial Attack on a fire, it is my way of telling them to start thinking about what it is they are arriving to do....it quickly came into mind... "Time to put your game face on!" The column was growing, I couldn't tell if this was just do to our closer proximity to the scene or if the fire was actually getting larger. I radio'd, "H-44... Zero Romeo Lima, on air to ground operational"... no answer... "H-44... this is Zero Romeo Lima, air to ground", that is when the emotional return call occured... "Romeo Lima... H44"! His voice showed obvious stress and was rapid in pace... it set a new sense of urgency in my ability to understand what the situation on the ground was... As we arrived on scene I asked my pilot to pull me into a left hand orbit over the accident sight. For the first time I was getting a good look at the debris field and intense fire that was quickly consuming the aircraft as it lay on its side along the tree line. "H-44... Romeo Lima, were just coming on scene. How can we be of assistance" the question seemed out of place as it crossed by lips. We were ill equiped as I had not left the helibase with any expectation of what we were now seeing on the ground. H-44 asked if we could transport victims... I quickly answered that we could. I then asked how many victims and were they ambulatory (able to walk) or not. Following their communication to me I clarified what I heard... "H44... Romeo Lima, let me understand you have 4 victims for transport. Two which are ambulatory and two which will require a backboard. Both ambulatory victims are at H-44 the two requiring a backboard are downslope from the accident site?" The scene was starting to unfold before me... I immediately contacted helibase on the victor and confirmed that we were on site and that I needed to launch two evac ships with medical personell and litter capability... Earlier as we approached the scene I had heard the Helicopter Coordinator request the two helicopters doing water drops on another part of the fire to be diverted to the incident... I had forgotten about them until I paused on victor and heard the first of those two ships communicate that he was arriving on scene. I spun my head to the left to see him pulling into an orbit over the incident right behind us but much lower. The pilot frantically contacted us to let us know, "I have a load of water, do you wish me to drop on the crash and is the site clear? I am bingo fuel and have only about 30 seconds on scene"... Everything up to this point had been in slow motion, and it was as if someone dramatically hit the fast forward button! I quickly switched over to the air to ground channel to ensure that H-44 wished to have the pilot drop and that all was clear... meanwhile Nicole (pilot) was talking to the arriving aircraft telling him to hold on... I gave Nicole the thumbs up as I told the ground personnel that the helicopter was inbound to drop, she relayed immediately over the victor to the pilot to make his drop... he was bingo fuel, meaning he had no more time to waist if he was going to make it back to the helibase... before she had the words out of her mouth completely the ship dropped its load of water on the burning wreckage. Things were happening very quickly at this time... the radio was starting to congest on both the air to ground but especially on the victor channel being utilized by the pilots and helibase... I asked myself, "where is HLCO!" I made the call over the radio to inquire as to the Helicopter Coordinators location... he said he was on scene! I could not see him and the second water ship was coming on scene... I made the decision to continue coordination of air resources... I wished that we could land and take the first of the victims, but I knew that if we did not coordinate the many helicopters arriving on scene that we had the potential for another accident which would compound the situation. I confirmed that helibase had launched two medivac ships, 5 Kilo Alpha was only a couple minutes out... the Price Valley exclusive use contract medium a bell 212. They had medical personnel on board and someone to help take over the scene on the ground... I then knew that my decision to coordinate at this time was the right one... 5KA arrived and landed on H-44 dropping off a couple of people with medical gear. They were then repositioned up the ridgeline to the north where they found an unimproved spot to land... they did so and continued rotors turning. This was essential as the Teton Helitack ship was just arriving behind them... they too would have medical personnel on board and would require a place to land... and we set them down on H-44. They stayed spooled up until all personnel had departed the helicopter then they repositioned about 50+ feet to the north along the same ridge... this would make more room for additional helicopters to come in... they then shut down to wait for the first victims to be prepared and loaded. Earlier while things unfolded and ships started to arrive I had asked H-44 if they had a manifest for the helicopter that crashed, they did and the number on the manifest was 11 people... I had done the quick numbers... 11 on the manifest and 2 pilots (as was the standard for the S-61) put 13 people on board. I confirmed again the number to be transported to medical facilities was 4... this was confirmed... I assumed at that time that there were fatalities... looking down at the scene there had to be fatalities... But then there were a lot of people running around on the hill. I had a hard time with this, as originally we were coming up to extract helitack... not a lot of crews... where did all of these people come from? Could more of them have gotten out... but then why don't we need transports for them... there had to be fatalities... and instantly my mind was snapped back into performing the critical task of coordinating the helicopters arriving on scene... I got word that Air Attack had been launched from Redding. I also heard that another light helicopter was coming from Willow Creek Helibase along with the Type 1 Helibase Manager (whom is also a paramedic). I asked that this helicopter come up with the equipment we needed in order to install our litter kit and a backboard. The water dropping ships continued to arrive and place water on the fire... everything was happening in a fast paced manner! Their were a lot of helicopters in a very confined space... but the pilots were doing a wonderful job talking to each other. The smoke was getting think and our area of operation was starting to close in. I knew at this point both Price Valley and Teton Helitack were on scene along with those whom had been providing extrication and medical attention from the time of the accident... those that witnessed the accident. My heart was breaking for those people on ground... I was sick! The second helicopter from the Trinity helibase arrived on scene... and so did Air Attack... I can't say that things went a lot smoother at this point, however... it was no longer my job to coordinate. It seemed that Air Attack spent a lot of time on the victor trying to coordinate the helicopters and seemed to miss several transmissions from the ground personnel... I had been talking with them just fine on air to ground... however now they frantically tried to contact him on Air Guard (an emergency aviation channel that all aircraft must monitor). Things were quickly spooling up and the chaos had began... an air ambulance arrive from Redding and landed next to the Teton Ship on H-44... we pulled into an orbit to the west of the incident just awaiting the moment that we could be of assistance. This moment never really came... at about 15 minutes to 2100 we departed along with two other helicopters for the Willow Creek Helibase. It was late and the sun was setting... if we didn't get on the ground soon we would break our own rules and policies... something we were willing to do, however as medical helicopters arrived on scene it was evident that they had enough helicopters to transport the victims and we were no longer filling a vital role on scene. It was time to take ourselves out of the equation... to mitigate any further risk of a mid-air collision or additional accident to compound the situation. The two helicopter providing transport of victims remained on scene... I'm sure breaking the guidelines we typically work under in order to provide life saving transport of survivors to medical facilities... something any of us were willing to do, and something that those two pilots should be supported for doing... As I flew back into the Helibase I snapped the final picture that I had room for on my camera... a glorious sunset on what would have been a wonderful day had it not ended in tragedy for the crews working on the Iron Complex that day. Back at Helibase there was a lot of confusion as people tried to asses what had just occurred. In the end 4 people survived the helicopter crash, a pilot and 3 crewmembers off of the greyback forestry hand crew. 9 lives had perished in what would be the deadliest firefighting incident (next to the firefighters who perished on 9-11 at the twin towers) to occure in the past 30 years. I don't know that my telling of this story will help me in any way. I don't know that it will help anyone else to understand what went on that day. I am deeply saddened and my heart is broken for those families left behind by the men that died on that day. I have always known that firefighters are a brotherhood... and in the aviation world their is even a stronger brotherhood... at times crews and pilots alike will critique and in jest give each other a hard time. Every crew feels as though they have something that others are missing and that perhaps this makes them better, or gives them a reason for bragging... ego's run wild in the firefighting community... However, when tragedy hits... or the need is there... in the end it is a family... a brotherhood... a group of tightly connected individuals that would jump of the nearest cliff in order to support or save their fellow firefighter... I feel a tight connection to those that lost their lives, and yet I know none of them personnally. I will struggle with the emotions I have felt since I first arrived on scene at this tragedy. I feel a level of shame for having such emotion... as I know others are struggling with an even closer connection and the impact they feel is undoubtedly larger than my own. But that being said, on this day I lost several of my brothers! I will remember them throughout my life... and although it is too late to avoid emotional commentary and dramatic writing, I will say that what I have written is done in the best way I know how in order to paint the picture of emotion that was intertwined with the efforts of the people involved on the hill at H-44. I would like to thank those many people involved in the rescue efforts for the heroic actions that they took. They are hero's to me! I hope that as you read this blog... you will be inspired to thank your local firefighters... you may not always agree with what decisions agency personnel make concerning wildland firefighters and the tactics utilized to fight them... but when the call comes for the suppression of these fires, those who answer the call are select few whom I consider to be my brothers and sisters in this industry and whom I have the utmost respect for. If you haven't lately... Thank a Firefighter! I helped carry Jim Ramage to the helicopter that would take him on his last flight. His remains were draped in an American flag. Firefighters hovered over the remains of four that day and I had been ensuring that Jim was taken care of. He was carried with honor and dignity up a steep hill by myself, Jim Morrison and four firefighters. We put him in the back of a 212 along with another and then the bird was started and then lifted off. The familiar Whop-Whop-Whop sound of a Bell stirred the air and it brought tears to my eyes. How many times have we all heard that sound and still love it? How many times had Jim heard it in Viet Nam, flying contract, flying for CDF, and then for the USFS? It's been a long, tough, exhausting, painful lousy week. I have been putting this off since last Wednesday when I was told that my friend, our friend, Jim Ramage was taken from us. Since then, there has been no time to sit down and remember. So here it is going on midnight and I still can't get to sleep because I'm remembering what a good, decent man Jim was. What gets me is that he called me last Tuesday afternoon and I can still here his voice letting me know that he wanted to get together with me at Trinity and he was looking forward to the visit. I got the message and grinned when I heard him give his usual greeting to me which was always, "Hey Chuck, this is Jim". I thought I would give him a call Wednesday morning and let him know when I would be there. I never got to make the call. I remember the pain, the disbelief, the empty feeling in my stomach all those years ago when I lost some good friends and that pain, disbelief and empty feeling returned with a vengeance. This could not be happening. But, it was. I will only talk about the Jim I knew. I can remember the first time I met him and shook his hand. His head went up and down faster than his handshake and my eyeballs caged just watching him. I always loved to give him a hard time about that and he would just grin. He was passionate about doing the right thing for pilots. He was respected by all for his honesty and professionalism. Jim was a stickler for details and making sure that I knew when I was going down the wrong path. There were some times when he and I got into some pretty heated arguments but that never, ever, affected our friendship. He was the best of friends. I miss him a lot already and it hasn't even been a week. I had the pleasure of going to his new house this last May for supper. Diane met us at the door and what a wonderful woman. The house was lighted just right and the table was set and all was in order. Jim could hardly wait for me to get the tour of the house over with so I could go see his, "shop" in the garage which was far from a shop. I laughed as did he when he gave the tour. Jim was a blessed man. This was their retirement home and I remember the three of us talking around the dinner table that night about how Ann and I needed to come out and stay down in the "shop" and have a good visit when we were all retired. It would have been good. It was such a good time that night. I'll always remember that evening. To the end, Jim was helping people. Make no mistake that he was a guardian angel to some of those folks on the helicopter that day. That is the way he should be remembered; helping others to the end. Jim Ramage. A patriot, a husband to Diane for over 40 years, a father, a provider for his family and a good friend to all of us. Remember his family in your prayers. He is missed. So long Jim. For those who will be attending this Saturdays Service in Redding for Jim Ramage, please note the family has requested that you wear your flight suit. You will likely be sitting directly behind the Family. Faye and I plan to get there early since there could be over 3,000 in attendance. I have attached a copy of the USFS News Release regarding the date and time for Jim's Service. Needless to say, Jim Ramage was a great guy with an excellent sense of humor. He was an outstanding Aviator and a very GOOD FRIEND. He truly will be missed by everyone who ever had the privilege of working with him. After many years as Forestry Pilot #1 for California Division of Forestry and Fire Protection (CDF; now Cal Fire) based at Vina HeliTack Base, Vina, CA, Jim was promoted to CDF Chief Helicopter Pilot; he retired from CDF in 2003. Jim's current job was Helicopter Inspector Pilot for Fire and Aviation Management, Forest Service, United States Department of Agriculture.